Willem Janszoon (1570-1630), also known as Willem Jansz was was a Dutch navigator and colonial governor. He was aboard the Hollandia, part of the second fleet dispatched by the Ductch to the Dutch East Indies (what is now Indonesia) in 1598. 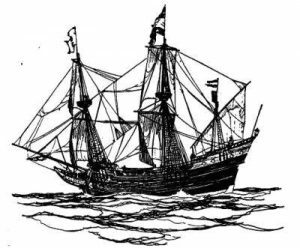 In 1606, he was sent from Bantam in the East Indies (now Indonesia) to see what he could find around the coasts and islands of New Guinea, a land that was supposed to be very rich in gold. He set sail on a small boat called the Duyfken (which means ”Little Dove”) towards its western coast. From the coast of New Guinea, Janszoon then crossed the Arafura Sea in a southerly direction, passing by the Torres Strait (first discovered and sailed through by the Spanish captain Luis Váez de Torres, in the same year) which would have been discovered had he kept traveling further west. 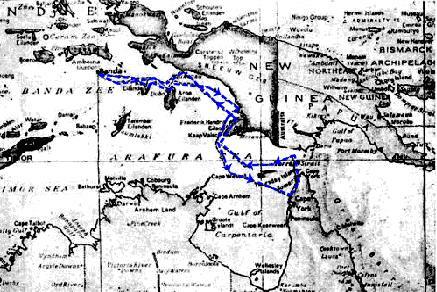 Janszoon then traveled alongside the western coast of Cape York, and landed near the modern town Weipa. He continued to chart the coastline for another 320km believing that this land was part of New Guinea, since he did not know about the Torres Strait. Seeing that the land had no potential for trade, and the natives unwelcoming, he decided to return to Bantam (in Indonesia) in June 1606 at Cape Keerweer, which means turn about. Jansz was the first known European to have landed in Australia.